References to keys on your keyboard are placed inside square brackets. For example: [F1] means press the “Function” key labelled “F1”. [Shift F1] means hold down the “Shift” key and then press “F1”. Press the function keys at the top of the keyboard for shortcuts [F1] to [F12]. Press [F12] to save changes and exit. Use the shortcut keys (see above) if you see a shortcut label. Move the mouse cursor over the object and click the left mouse button. To activate buttons, click on them with the left mouse button, or press [Enter] after moving to the button. To activate controls such as links (underlined text), click on the link with the left mouse button. To activate other controls such as items in a list box , highlight the item then press [Enter] or double click on the item. You can select menu items with the mouse or the listed short cuts. Many objects display a menu when you click on them with the right mouse button. These menus relates specifically to the item under the cursor (they are context sensitive). 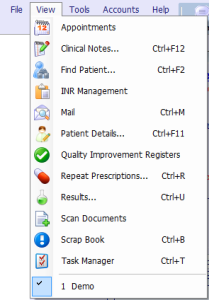 Note: The tool bar buttons across the top of the screen are global (not related to a currently selected patient) . You will be prompted to select the patient as required. (On many screens, you will be able to open other functions related to the currently selected patient directly).